While Gracie endured a self-imposed nine-day exile under the sofa, life around her went on. And while I'm quite sure she would have stayed there indefinitely if allowed to, Gracie was about to be rudely forced out of hiding. 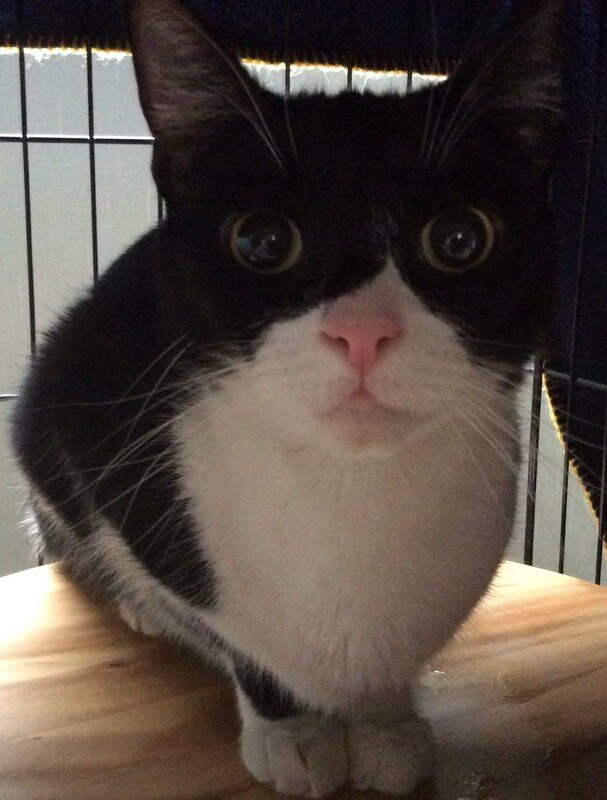 Being a young and recently rescued cat, a trip to the vet was required. Not only did Gracie need to be checked over, she needed her vaccinations. While any progress between Gracie and I was invisible to the naked eye, I hoped that through our daily contact she was beginning to get used to me and that the familiarity would lead to trust. So there was NO WAY I was going to be the one to put her back into the carry box for the trip to the vet. Fortunately for us both, my partner David agreed to help out. Unfortunately for us all, the first attempt to get Gracie into the box was not successful. In hindsight I feel like an idiot for not blocking the chimney before attempting to move Gracie. 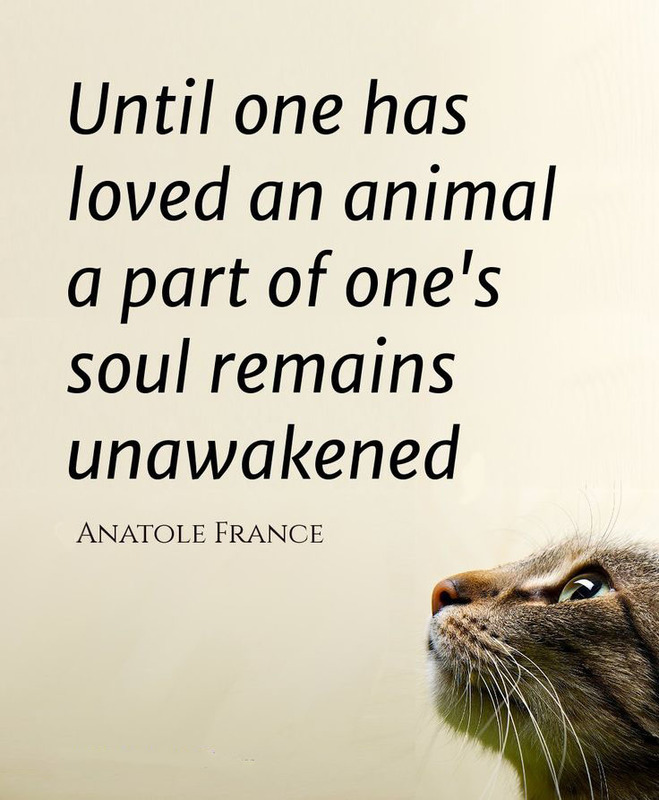 But when a cat hasn't moved at all in nine days you forget that when push comes to shove cats can move far more quickly than unsuspecting humans can. Turns out, Gracie wasn't entirely rigid. She darted up away from David and up the chimney stack faster than the speed of light. Behold the aftermath (when I filmed this, Gracie was still in the chimney and I was in tears). I was beside myself. Never mind the mess, I was sure Gracie would die up there. 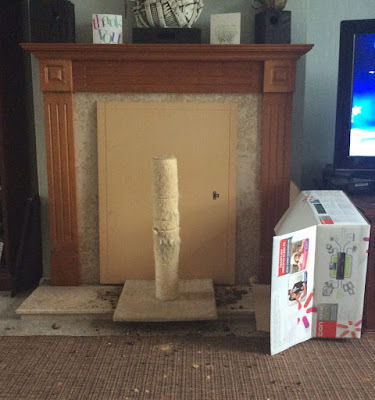 The chimney wasn't in use - thank goodness - but it contained a huge amount of soot, most of which Gracie dislodged as she scrambled up the stack. 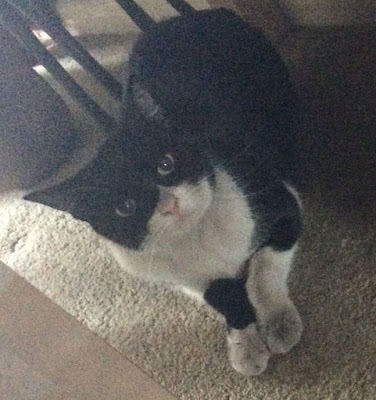 I hadn't been able to coax her out from under the sofa yet, so there was no way she was going to come out of the chimney with me in the room. We decided the best, and possibly only, course of action was to leave her alone for a few hours in the hope she'd find her own way down. 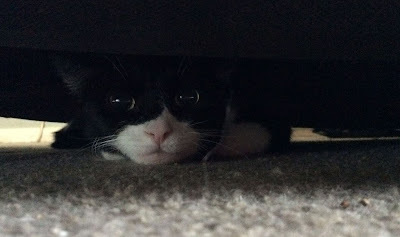 I returned to the room four hours later and there she was, back under the sofa. We were more successful in getting her into the carry box the following day, when the extent of the mess she'd created became more apparent. Just as well we were going to see the vet as I was very concerned that she may have breathed in soot or licked soot from herself and become ill. I'm pleased to say she was given a clean bill of health in this regard. 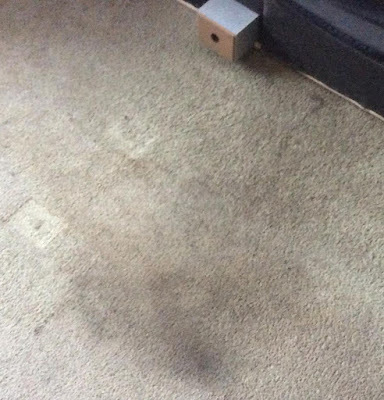 Sadly, the same could not be said for the carpet. I know it seems obvious now, but we hadn't seen Gracie move at all in over a week and didn't anticipate how fast she could go when she put her mind to it. This blog is full of mistakes. Not entirely my fault and definitely not Gracie's fault. Every cat is different. One thing I did get right was correctly setting my expectation for a long journey ahead. Some rescue cats settle into their new environment right away. One of my other cats, Smudge, span in circles of joy when released from the carry basket into his new home. Remembering how well Smudge had done being restricted to the large lounge in my former home (in Abbots Langley, Herts) I decided to do the same with Gracie. At that time I lived alone in a 3-bedroom, semi-detached house with Derek (my other cat). It was a quiet home with lots of space and I assumed Gracie would benefit from this. I opened the door to Gracie's carry box and left the room so that she could spend some time alone getting used to the sights, sounds and smells of her new home. On returning to the room a few minutes later I was pleased to see the carry box was empty. This was a good sign. Gracie had taken her first, tentative steps into her new life. Unfortunately, she wasn't investigating her new home with quite as much enthusiasm as I'd hoped. Instead, she'd wedged herself under the sofa. This is to be expected. 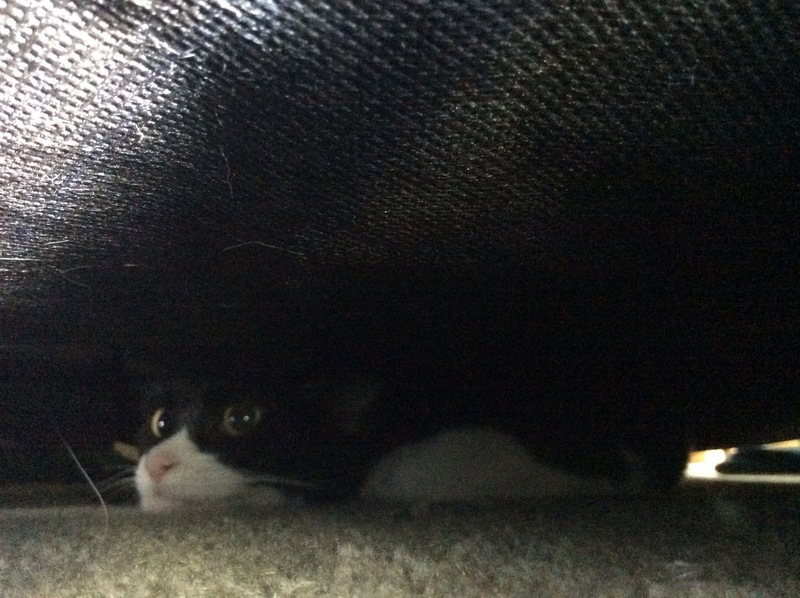 Cats like to be under things, ideally in a spot where they can observe what else is going on while feeling safe. However, I hadn't reckoned for just how scared Gracie would be. While I knew that I meant Gracie no harm, Gracie didn't know this. Her new home under the sofa soon became her prison. When I looked under the sofa, with the aid of a torch (shone to the side of her, not directly at her face), all I could see was a flash of white and two large, mistrustful eyes. Everything I felt Gracie needed was in easy reach of her: fresh water, fresh cat food (wet and dry), litter tray, scratching post. Over the next nine days, these items gave me the only indications that Gracie was moving out from under the sofa at all. When I was in the room (not too often because I wanted to give her peace and quiet) she stayed stock still. Only when she knew for sure that I wasn't around did she venture out into the room to eat, drink and answer the call of nature (that's one of the wonderful things about cats, no matter what their psychological state they still tend to respect litter tray etiquette). Concerned about her weight and wanting to create a bond between us, I decided to try feeding Gracie some cat food using a fish slice that I slid under the sofa towards her. This worked to an extent. She took the food, but I believe this was because she was extremely hungry - my presence was merely tolerated. Even after days of patiently feeding her this way (it's not easy for me to lie flat on the floor these days!) there was no real progress. She never asked for food, and never moved closer to take it when offered. But at least she was eating. So, if she's eating, drinking and using the litter tray how did I know I'd made a mistake? Because after nine days she should have begun to explore her surroundings a little more out of sheer curiosity. And the reason she didn't? If you have a nervous, anxious or frightened cat, you can help them to feel more secure by placing them in a smaller room with lots of places to hide. By putting Gracie in a large room I now realise I extended her anxiety a few days longer than necessary. The size of the room was just too overwhelming for her. 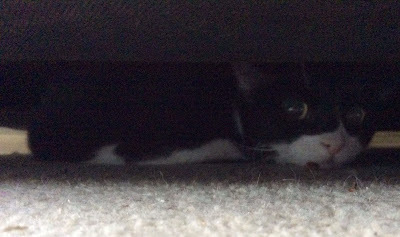 Hence she only felt safe when she was wedged under the sofa out of reach. "Ask all you like, I'm not coming out"
Before I launch into Gracie's story, I'd like to say a few things about what you should expect. My goal with Gracie was to get her better. Not to make a record of her suffering. Not to make her a YouTube star. I took some video (which you will get to see over the coming posts) purely to document Gracie's progress. Because the videos are not intended to make money or be exploitative they are very short. You will see enough of Gracie's situation to understand why she so desperately needed help but not enough to feel that her situation was exploited in any way. I mentioned at the beginning of this blog that when she came to me Gracie had been self-harming. She had painful-looking sores on her neck that were self-inflicted. However, these were well-healed by the time I took her home thanks to the loving care of the team at Wood Green, The Animals Charity. I did not take pictures of Gracie's injuries. There is no need for anyone to see them. All that remains of them now is one tiny bald patch where her fur didn't regrow. It's barely noticeable and I like to think she's now forgotten all about it. In fact, she's now such a chilled-out cat I can't imagine her ever doing that to herself again. 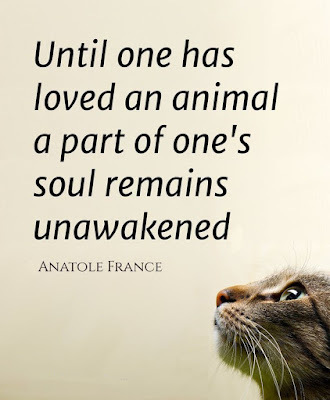 I love my cats and dog like they are my children. It's my hope that sharing how Gracie become (eventually) convinced that this new home was safe will inspire other potential cat rescuers to invest the time and patience it takes to turn a cat like Gracie's life around. If you do see anything on the blog that makes you feel sad remember that this story has a happy ending and there is video of Gracie looking full of joy and contentment to come. 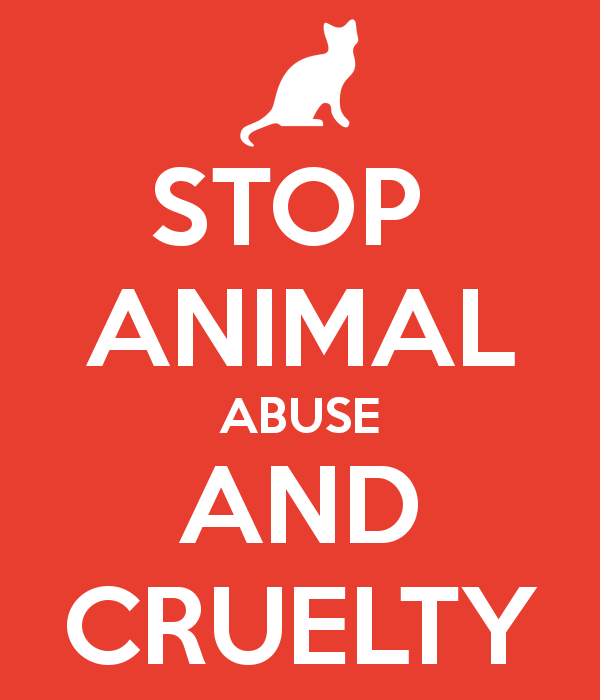 In my opinion, animal cruelty doesn't stop at direct physical and emotional harm and neglect. 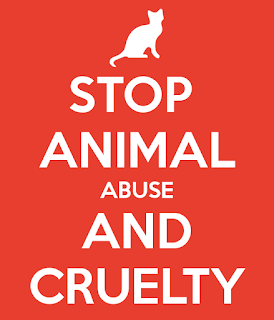 It extents to sharing videos of animals experiencing cruelty. There will be none of that here.